Oregon State instructor and outreach librarian Laurie Bridges wants to teach university students not just how to use Wikipedia with a more informed eye, but to create and edit Wikipedia pages themselves, and use that experience as a way to better their research skills. Legislators got together and said, "We want to be sure we don’t lose these companies, that they don’t leave the area." So the idea to create Oregon RAIN was born, and the intention was primarily initially to work with the entrepreneurs and the innovators coming out of (Oregon State University) and the (University of Oregon) and then also (to) highlight programs as needed. .
.Benton County, home to Oregon State University among other large institutions, had only 86 percent of children who had received both measles doses. 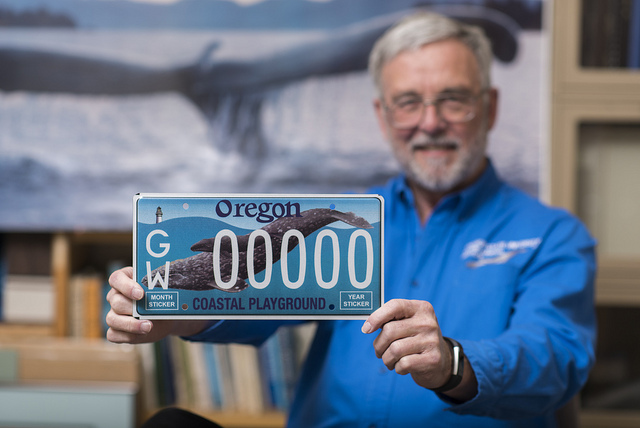 A whale of a license plate: Bruce Mate, director of the Marine Mammal Institute based at Oregon State University's Hatfield Marine Science Center in Newport, holds a new license plate featuring a gray whale mother and her calf. It is available at Oregon Department of Motor Vehicles offices throughout the state beginning on Feb. 1. A portion of the cost of each license plate sold will go to Marine Mammal Institute for marine mammal research, education and outreach. Photo credit: Hannah O'Leary. NEW! Using Student Ad Hoc Lite Reports in Core: In CORE, Ad Hoc Lite reports provide a powerful tool to query on a large student data set and build a variety of reports to suit your business needs. This session is designed to give employees in the STU3 or higher security levels an introduction to ad hoc lite reports, what they can do with these reports, how to use them and some common use cases. Tuesday, Jan. 29, 2-3 p.m., Cascade Hall 118. Note: This session is restricted to employees with an STU3 or higher CORE security level. Contact IAR with questions at iar.ref@oregonstate.edu. Register Here. Documentary Screening & Q/A Panel Session: Enjoy a showing of the Nova documentary “Decoding the Weather Machine” followed by an expert Q/A panel. The film focuses on weather, climate and climate change solutions. Free admission, light refreshments, and open to the public. Jan. 29, 7 p.m., in the Memorial Union Ballroom. More info at http://blogs.oregonstate.edu/ametsociety/events/. Eating Animals: A film screening and discussion, based on the best-selling book by Jonathan Safran Foer, Eating Animals - a look at the environmental, economic, and public health consequences of factory farming. Tracing the history of food production in the U.S., the film charts how farming has gone from local and sustainable to a corporate "Frankenstein monster" that offers cheap eggs, meat, and dairy at a steep cost: the exploitation of animals; the risky use of antibiotics and hormones; and the pollution of air, soil, and water. Wednesday, Feb. 6, 6 p.m. MU Lounge. Free vegan pizza. Out of the Darkness Campus Walk to Prevent Suicide: CAPS is coordinating the American Foundation for Suicide Prevention (AFSP) Out of the Darkness Campus Walk for OSU. Save the date: Saturday, April 27, 10 a.m. to 1 p.m., SEC Plaza. This will be the first campus walk in the state of Oregon. The goals of the Campus Walk event are to reduce stigma, educate about resources, support loss survivors and raise money for national and local suicide prevention. Consider joining as either a virtual or “IRL” (in real life) walker by visiting http://bit.ly/OSUoutofthedarkness. For more information, contact Tess Webster-Henry: tess.websterhenry@oregonstate.edu. Consider registering as a team captain and recruiting members of your department to participate. NEW! Ecology, Evolution, and Conservation of Biodiversity (EECB) Seminar Series: Marm Kilpatrick is an associate professor in the department of Ecology and Evolutionary Biology from the University of California Santa Cruz. Kilpatrick’s talk, "Cryptic connections, microclimates and host responses drive variation in the impact of white-nose syndrome on bats," will be held on Wednesday, Jan. 30, 3-4 p.m. in Withycombe 109. Kilpatrick’s diverse research program is focused on infectious disease, evolution, climate, behavior, genetics, and conservation. His research in disease ecology looks at local drivers of pathogen transmission and the impact of disease on animal and host populations. More about Kilpatrick's work can be found at http://kilpatrick.eeb.ucsc.edu. NEW! Horticulture Department Visiting Scholar: Michael Cahn, irrigation and water resources adviser, University of California Cooperative Extension, will give a lecture titled “Developing an Online Decision Support Tool for Irrigation and Nutrient Management of Vegetables and Strawberries on the Central Coast of California.” He will speak in Ag and Life Sciences (ALS) 4000 at 3:30 p.m. on Thursday, Jan. 31. Mental Health First Aid: Mental Health First Aid is an eight-hour course that teaches you how to help someone who is developing a mental health problem or experiencing a mental health crisis. The training helps you identify, understand, and respond to signs of addictions and mental illnesses. 8 a.m. to 5 p.m., MU Journey Room 104 on Friday, Feb. 1. Preregistration required: bit.ly/OSU1stAid. Space is limited. Lunch will be provided. NEW! Be a presenter at the Ecampus Faculty Forum: Contribute to Oregon State’s excellence in online teaching and learning by sharing your expertise at this spring’s Ecampus Faculty Forum. Submit your proposal for a presentation by Feb. 10. Interactive sessions are encouraged but conference-style presentations are also welcome. The faculty forum will be held May 1 at the CH2M HILL Alumni Center. NEW! Library Undergraduate Research Awards offer $1,000 scholarships: The deadline for applying has been extended to Feb. 18. Impressed by a student’s research paper or project? That student could win $1,000 for their work through the Library Undergraduate Research Awards, which offer one prize for a paper or project in the arts and humanities and another for work in social sciences, sciences or engineering. Encourage your worthy students to apply. More info is at http://library.oregonstate.edu/awards/undergrad-research. Apply Now for Inspiring Girls Expeditions: Inspiring Girls Expeditions provides tuition-free science, art, and wilderness exploration for teenage girls (aged 16/17). Applications are open now and must be started by Feb 1 visit http://inspiringgirls.org for more information. As a new OSU CEOAS outreach program, we encourage students, faculty, and staff to contact us if you are interested in getting involved. Contact info@girlsonice.org. “The World is my country, all mankind are my brethren, and to do good is my religion." ~ Thomas Paine. Corvallis: Areas of fog and then mostly sunny, high of 48, low of 36. Slight chance of showers Wednesday. Central Oregon: Mostly sunny Tuesday, high of 43, low of 29. Partly sunny Wednesday. Newport: Mostly sunny, high of 52, low of 43. Chance of showers Wednesday.